With diabetes affecting 1 in 4 seniors, many caregivers are taking care of someone with this serious health condition. To avoid severe diabetes complications, it’s important to help your older adult make lifestyle choices that keep blood sugar at healthy levels. Vive Health shares an essential checklist of 8 ways to manage diabetes in seniors. If you care for an older parent, spouse, or relative, there is a good chance you’re helping them manage their diabetes. Over 100 million people in the U.S. have diabetes or pre-diabetes, according to new data from the Centers for Disease Control. That includes 1 in 4 adults over the age of 65. Like high blood pressure, diabetes can sometimes feel like a silent disease because symptoms don’t necessarily present in striking ways until something goes wrong. Unfortunately, long-term complications from uncontrolled diabetes can result in stroke, heart attack, nerve damage, kidney failure, blindness, hearing impairment, skin infections, and more. If you’re caring for an older adult with diabetes, this essential checklist of 8 ways to manage their disease helps you support them in the best health and quality of life possible. The beginning of any caregiving journey begins with education. Learning about your older adult’s disease and its management and treatment will equip you with the knowledge and tools you need to successfully face it together. Authoritative medical sites like MayoClinic.org and the American Diabetes Association have a lot of help information about diabetes. You may also be able to find diabetes education classes at local health clinics or hospitals that you and your older adult could attend together. Lifestyle changes like exercising more and eating a healthier diet will benefit your older adult — and you as well. Committing to small changes together can also be the show of support your older adult needs to take action towards improving their health. Physical activity plays a key role in keeping blood sugar levels down and helping with healthy weight loss. But it’s important to know that It can be dangerous to exercise when blood sugar levels are already low. Keep physical activity guidelines in mind, like scheduling exercise about an hour or so after a meal when blood sugar levels are usually higher. And always carry emergency items like glucose tablets, water, and carb-rich snacks with you anytime you and your older adult exercise away from home. Did you know that increases in stress levels can negatively impact blood sugar levels? The fight-or-flight response that’s triggered by stress doesn’t work properly in people with diabetes and can spike blood sugar levels. Help your older adult practice positive self-care techniques like meditation, yoga, developing a new hobby, or even getting a massage. Participating in these types of activities also helps you reduce your caregiving stress. 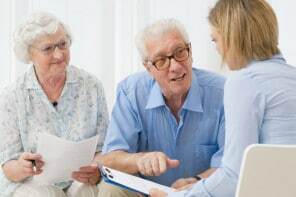 As a family caregiver, you might find yourself advocating for your older adult’s health with their doctors and health providers and with your older adult themselves. It can be tough for someone to face a diagnosis like Type 2 diabetes and have the strength and clarity to fight it head-on. Helping them with self-monitoring puts control in your older adult’s hands. Encourage them to use an at-home blood sugar monitor to track accurate blood glucose levels each day and take notes on how diet, exercise, and stress affect them over time. A diabetic emergency is a scary thing — fainting from low blood sugar, a slow healing wound that develops a severe infection, or going into shock from diabetic ketoacidosis. It is crucial that your older adult has some sort of Medical ID on their person in case there’s an emergency and you aren’t with them. This might mean having them wear a Medical Alert ID bracelet or necklace or entering Medical ID information into the emergency info section on a smartphone they regularly carry. Managing diabetes may require your older adult to take medicine. Use pill organizers to stay on top of daily doses and avoid accidentally running out, taking too much, or taking too little. Attend doctor’s appointments with them as much as possible and make sure general practitioners and specialists are aren’t prescribing medications that may interact with existing diabetes medication. Don’t be shy about reaching out to others. You’re definitely not the only caregiver helping a family member manage diabetes. Ask your local hospital or senior center if there are support groups for caregivers of people with diabetes. Or, check online and on social media for private support groups to find caregivers who are going through a similar journey.